Journal of Hepatology 2016 ; Oct ;65(4) : 734-740. Sustained virological response following antiviral interferon- based treatment of chronic hepatitis C is associated with decreased long-term risk of hepatocellular carcinoma (HCC) in advanced liver fibrosis. An unexpected high rate of HCC recurrence following antiviral treatment using direct acting antiviral (DAA) has been recently reported. We analyzed data individually from three French prospective multicenter ANRS cohorts including more than 6,000 patients treated with DAA and we focused on HCC patients who underwent curative procedures before DAA treatment. The aim was to assess the rates of HCC recurrence in these patients according to antiviral treatment regimen. In the ANRS CO22 HEPATHER cohort, 267 patients with CHC who were previously treated for HCC were analyzed, among whom 189 received DAA and 78 did not. The rates of recurrence were 0.73/100 and 0.66/100 person-months, respectively. In the ANRS CO12 CIRVIR cohort, 79 cirrhotic patients in whom HCC was diagnosed and treated, 13 received DAA and 66 did not. The rates of recurrence were 1.11/100 and 1.73/100 person-months, respectively. In the ANRS CO23 CUPILT Cohort, 314 liver transplant recipients for HCC who were subsequently treated with DAA were analyzed. Seven HCC recurrences were reported after a median time of 70.3 months after liver transplantation. The rate of recurrence was 2.2 %. In three distinct prospective cohorts, we did not observe an increased risk of HCC recurrence after DAA treatment, notably in patients who underwent curative HCC treatment including liver transplantation. A debate recently arised regarding a higher risk of recurrence of hepatocellular carcinoma (HCC) in HCV-infected patients who have been treated by direct acting antivirals (DAAs). While SVR is usually associated with a decreased risk of both HCC occurrence and recurrence, what could explain the paradox of an increased risk of HCC in DAA-treated patients who achieve more than 90% of SVR ? Authors hypothesized that the rapid control of inflammatory state could impact anti-tumoral immune control allowing for tumor clones emergence. Two retrospective studies from Spain(1) and Italy(2) indeed reported provocative results evidencing such a higher risk. Some methodological issues to those results have been raised suggesting that « While care should certainly be taken when introducing new treatments in a setting such as HCC, where two diseases such as cirrhosis and cancer generate competitive risks of events …, premature to raise a red flag on DAAs »(3). They recommended an appropriate comparison with the benchmark reference of untreated controls. That is what we did in a collaborative work which merged the results of 3 distinct prospective multicenter ANRS cohorts including more than 6,000 patients treated with DAA . We focused on HCC patients who underwent curative procedures before DAA treatment in order to assess the rates of HCC recurrence in patients according to antiviral treatment regimen. In the ANRS CO22 HEPATHER cohort (267 patients previously treated for HCC of whom 189 received DAA and 78 did not) and in ANRS CO12 CIRVIR cohort (79 cirrhotic patients who received curative treatment of HCC among whom 13 received DAA and 66 did not), the rates of HCC recurrence did not differ in DAA-treated and untreated patients. 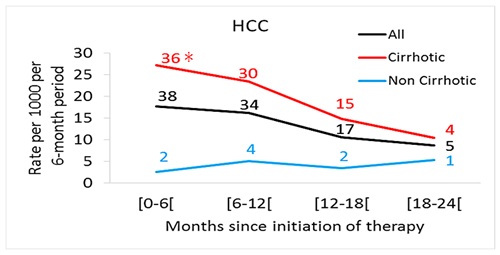 In the ANRS CO23 CUPILT Cohort, rate of HCC recurrence after liver transplantation for HCC and subsequent DAA treatment was 2.2% after a median of 70.3 months of follow-up, a rate lower than the one previously reported in the absence of treatment (between 5 and 20%)(3); 5 of the 7 patients with recurrence had predisposing factors for recurrence. In summary, in these three distinct ANRS prospective cohorts, there was no increased risk of HCC recurrence after DAA treatment, notably in patients who underwent curative HCC treatment including liver transplantation. Finally, it is noteworthy that in the prospective Hepather cohort of DAA-treated patients, there is some evidence of a significant decrease in the risk of occurrence of HCC following SVR(4). Buonfiglioli F CF et al. . Development of hepatocellular carcinoma in HCV cirrhosis patients treated with direct acting antivirals. J Hepatol 2016;64 (S2) : LB506. Cammà C, et al. Direct antiviral agents and risk for HCC early recurrence: much ado about nothing. J Hepatol 2016 ; Oct ;65(4) :861-2. Clavien PA, et al. Recommendations for liver transplantation for hepatocellular carcinoma: an international consensus conference report. Lancet Oncol 2012 Jan;13(1):e11-22. Clinical outcomes in HCV-infected patients treated with direct acting antivirals-18 month post-treatment follow-up in the French ANRS CO22 HEPATHER Cohort Study. ANRS/AFEF HEPATHER Study Group. J Hepatol 2016;64 (S2) : LB505.